Lebt in Thiruvananthapuram, Kerala. Dichterin, Übersetzerin, Sanskrit-Gelehrte, Direktorin des internationalen Kritya-Poetry Festivals in Indien. Sie hat 11 Gedichtbände veröffentlicht und ist mit zahlreichen Preisen ausgezeichnet, zuletzt mit dem Naji Naaman’s Literary Prize 2016. Ihre Gedichte wurden in 12 Sprachen übersetzt, zuletzt ins Chinesische, Estnische und Vietnamesische. Sie ist Gründungsmitglied des World Poetry Movements und Gast auf zahlreichen internationalen Festivals. Lives in Thiruvananthapuram, Kerala. 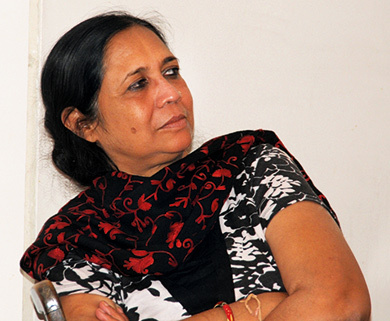 Rati is a poet, translator, Sanskrit scholar, Director of the international Kritya-Poetry Festival in India. She has published 11 poetry books and has received various awards, latest: the Naji Naaman’s Literary Prize 2016. Her poetry was translated into 12 languages, like Chinese, Estonian and Vietnamese. Sie ist Gründungsmitglied des World Poetry Movements und Gast auf zahlreichen internationalen Festivals. the result of being lost in sleep. for glimpsing a few, new dreams. and this time added paint to the thread. Before dark I’d built a door. dreams freed to roam the entirety of the night. each day bustled with thread and paint. though both sun and moon remain absent. in a seamless realm of light. and that even if she did, she couldn’t fly. And if unable to fly, why suffer the pain of wings? but death itself is flight. an illusion of silence amidst noise. carrying flight in her every cell. to love grandma’s soft, sweet feel. like a sugar packet into water.